Goodbye to the old Shea Stadium, home of the NY Mets since 1964. Make way for Citi Field. The stadium was just a train ride away from the Long Island towns where I spent my childhood. Whether you loved it or hated it architecturally, Shea was beloved by fans. It was an easy place to get to on the LIRR or the #7 Subway, and a safe place to go "unchaperoned" with friends whether for ball games or concerts. Several Web sites have now sprung up chronicling the destruction of the place where Seaver threw, Piazza squatted and George (the Stork) Theodore roamed. Here's the YouTube of the actual demolition. September 11, 2001. I was there. And this is how it was. I got off at Penn Station and took the Shuttle across town to Times Square and walked thru Grand Central Station in that carefree mode of a day tripper in New York. I remember stopping by the Transit Museum store down on the lower level of GCT for a few minutes and mentally buying Hanukkah presents for my sons who love trains and subways. Then I walked up to the street and a block over to my meeting at the URJ. I think the first plane might have hit while I was down in the subway, or maybe it was while I was in the elevator going up to the meeting. Why didn't I hear anything? It's still so dreamlike, even seven years later. My meeting was interrupted when Emily Grotta, the URJ Communications Director, walked in and said that a small plane had hit one of the World Trade Towers and there was a lot of confusion downtown. We would adjourn the meeting temporarily to get more information and then resume. Meanwhile, the staff tried to maneuver TV sets into the lobby area so we could watch the news, but we were asked not to leave the building. Everyone tried to make cell phone calls, without success. I ducked into an office and used the desk phone to call home. Miracle of miracles, it worked. I reached Jeff and he gave me the full picture. Astounding. Two planes...both towers had been hit...the Pentagon was hit...a hijacked aircraft in Pennsylvania had come down. "Nina, we're under attack." The thought hadn't even occurred to me until Jeff said it. TV sets were still not up and running at the URJ office. Bizarrely, I got the news this way -- a URJ staff member with a tiny transistor radio, walked over to the windows overlooking Third Avenue for better reception. He held the radio up to his ear and reported to us: "The South Tower has fallen." It was after 9:00 am and I still had not seen a single image of the destruction. Instead I found myself constructing pictures in my mind, as if it were World War II and we were all gathered around the family radio. 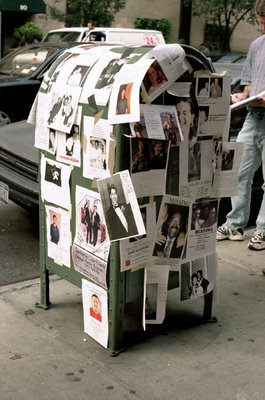 I went back to someone's office and tried to get news on a website... MSNBC, CNN, NY Times. Nothing. The internet was jammed. The next imperative was to check on loved ones. I learned that our kids were safe and in "lockdown" at their schools on Long Island. No elementary school kids would be released until a parent was contacted, such was the worry over local fatalities in a town that's a bedroom suburb of Manhattan. The High School was not allowing kids to watch TV, also fearful of that students would learn of their parents this way. Jeff tried to drive to the nearby Sands Point shoreline offering a good view of New York, but the road was already blocked by Port Washington police. My father had started out for New York but was turned back. Jeff was busy phoning every congregational family with jobs in New York. Everything below 14th Street was shut down, off limits. I told Jeff I'd either stay with my sister Emily on 16th St., or wait until trains were leaving New York. The TV sets were now working and the day unfolded with more images of horror and destruction than anyone could bear or integrate. 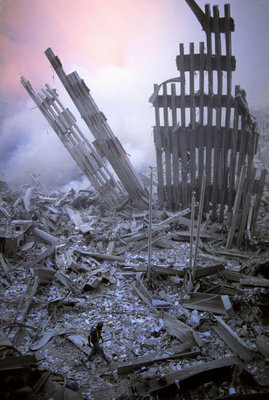 Over and over we watched the towers fall. Glued to the TV, we cried, hugged, recited tehillim (psalms) in an office where many staff members had loved ones who were employees in the World Trade Towers and the financial district. Several rabbis walked uptown to our building from the HUC campus in the Village to be with us. We were told again not to leave. No trains were coming into Manhattan. No trains were going out. Around 3:30 pm, we were advised that we could leave, or stay in the building. Nothing was going into New Jersey, but the Long Island Railroad had limited service. I decided to walk downtown to Penn Station. My biggest problem...stupid high heel shoes. I took them off and walked barefoot in the street, joining the dazed and somber parade of people doing their best to be supportive and gallant. Smoke was everywhere. As I headed down Third Avenue, the absence of the Towers was completely disorienting. It literally changed the light in the city. You never really noticed them before, but their absence changed everything. The train ride home. Weeping people, everyone sharing stories, and the city receding from view with every passing moment. There were no strangers on this train...we were all fellow travelers and comrades summoning every ounce of New York grit and determination and heart we posessed. Applause for the police. Applause for the firemen. Applause even for the train conductors who waited at every stop and never collected money or tickets. Astonishment that the sun was still shining on this apocalyptic day. Arriving home, I now learned that I had indeed lost friends. That several people I knew literally ran for their lives. I heard stories of friends who escaped death by the slimmest and craziest of accidental margins...home with a sick child, running late because of traffic, out for a doctor's appointment. Over the next days people in my town spoke in whispers of the cars in the commuter parking lot that sat unclaimed because their owners didn't return to drive them. We smelled the smoke that drifted across the waters and settled over Long Island. We attended community services. We processed the news. We knew we would never be the same. Nothing makes this old Lawnguylander's heart beat faster than flying into LaGuardia airport. (Try to sit on the left side of the plane.) You're hugging the New Jersey coastline and then suddenly there's New York harbor in view and the Statue of Liberty. Look slightly to the right for a panoramic sweep of lower Manhattan and the spot where the Twin Towers used to be. Then you arc up over the Bronx and Westchester and swoop right into LGA with a fabulous view of Shea Stadium, the National Tennis Center and the Manhattan skyline. For a New Yorker living in diaspora, it's magic. 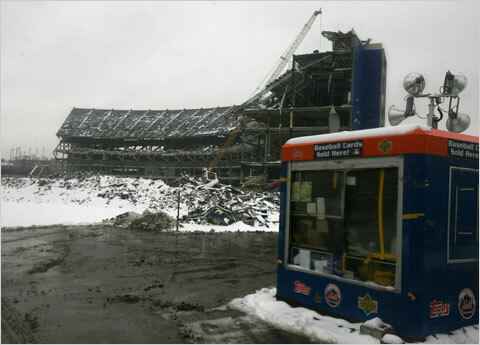 So now Shea Stadium is coming down and a new stadium is going up next door. I knew about this, but I guess I forgot it was really happening. 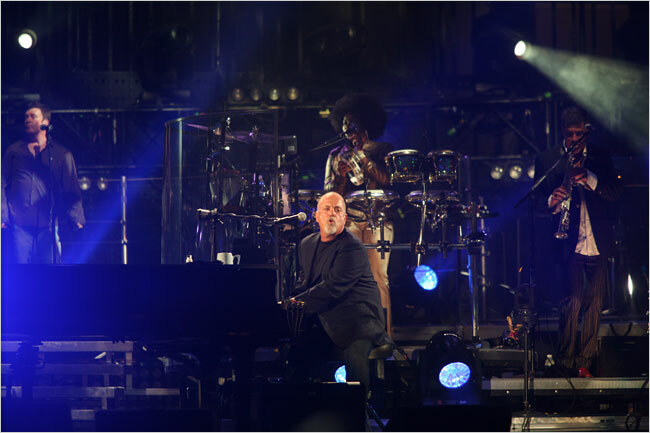 My oldest son, a die hard Mets fan, sent me the URL for a review of last week's Billy Joel concert-- his farewell ode to Shea. Billy, after all, is a son of the 'Guyland, from Massapequa for god's sake, like Rosie O'Donnnel and Baldwin brothers. Ya gotta love the guy -- he brought out Tony Bennett to join him in New York State of Mind. Other guest stars saying goodbye to Shea included John Mellencamp and Don Henley. Everyone knew they were on hallowed ground, where The Beatles had performed. Here's the slide show if you wanna watch. And the whole thing was filmed for documentary, so you might just get to see it. Thanks Billy. Thanks to the morons at Comcast, I haven't had TV for the past three weeks, but it hasn't kept me from breaking down and joining the cult of Joy Mangano. I just bought my first 2 dozen Joy Mangano huggable hangers and in about 2 minutes I'm going back to Bed Bath & Beyond for more. Lots more. Not familiar with huggable hangers? You mean you've never watched that annoying woman, Joy Mangano on HSN? Well, I now bow down to this daughter of Long Island because she is right, dammit. Her velvety flocked hangers really DO double your closet space. They keep flimsy things from falling off the hangers and puddling on the floor of your closet. And as Joy would say, "It's a closet revolution . . .no more shoulder bumps!" I NEED more. Huggable hangers are stupidly, moronically AMAZING and now all I want for Christmas or Hanukkah or my birthday (July 30th) is MORE HANGERS. Joy, with your Lawnguyland accent and your horrible hair you are my huswifery goddess, my downsizing muse. I get you. I love you, you scrappy little boomer-home-improvement-wench. It all happened because I have today and tomorrow off for Shavuot, a Jewish holiday ( I work for a Jewish social service agency) and I MUST get my clothes out of boxes and into the er, closets? We have guests from New York coming this weekend and it's really time to bit the bullet and unpack. The unpacking was actually coming along OK with one big exception. Closets. We don't have very many in this little bungalow and the ones we have are the tiny 1920's kind -- which is even worse than the 1960's ranch house kind. I have now come to believe that in the 1920's southern women in Druid HIlls simply didn't have clothes. I believe they wore the same 5 dresses in rotation and had their maids make sure those 5 dresses were always laundered, starched and ready to roll. In those sweet and simple days people also sent things into cold storage for the summer and also put slipcovers on the furniture for the warm months. What a concept. We would now applaud this as a "green" way of living. Saintly mom that I am, when we moved here I gave Gabe the gi-normous bedroom (22' X 12') which has a quite adequate closet but a crappy bathroom. I took the "middle room" in this house, which is utterly without closets but which is adjacent to the nice renovated Pottery Barn bathroom. So my little bedroom is now dominated by a fabulous wall of armoires from Fortunoff that I bought upon leaving the Motherland, Long Island. This mighty Wall-O-Storage used to reside in the old house in the Bed & Breakfast guest suite. Little did I know that it would become my main clothing storage space when I moved. [Please note that the TV is parked in the right hand unit, so really all I have is the two units on the left, and the caps on top.] It's a comedown...it's humbling, and we won't even talk about where to put the shoes. That's too depressing. But bring on the huggable hangers. Black, please. Luv ya Joy. Donald Trump is mucking about in my old 'hood and in my new hood. To your left is his concept for a $30 Million high end catering hall at Jones Beach, to be called Trump on the Ocean. It's on the site of the former Boardwalk Restaurant, built in the 60's to replace the original 1936 structure destroyed by fire. The 1936 structure was part of Robert Moses plan for Jones Beach, one of the most ambitious and monumental public works projects ever conceived. But the state is not rolling over for Trump right away. They denied him a variance for a basement at the planned restaurant because it sits on a floodplain. Duh...it's the beach! Naturally, not everyone is thrilled. Ya gotta love Lawnguylanders: From a Newsday message board, Big Bob says: "I love to see this whining little brat cry. Who are the people out there that think this trust fund baby is a business genius? Being born with millions does not make you a genius, and increasing that wealth only means you're mildly competant, and most likely just have good advisors. Guy's a bum, just ignore him and maybe he'll go away." "We don't need Fifth and Madison Avenue brought out here to Long Island," said Kerry Grubb, 50, of North Massapequa, who was out for an afternoon stroll on the boardwalk with his wife on their 24th wedding anniversary. While he railed about an "ostentatious" structure, his wife, Peg Grubb, lamented that the restaurant would be "ruining the serenity and the peacefulness of a place like this." Meanwhile, here in the ATL, where people embrace anything and everything new and shiny, Trump Towers are already rising in midtown. The project at 15th and West Peachtree streets in Midtown, near the Woodruff Arts Center, will feature two high-rise condominium towers, luxury retailers and destination restaurants. Phase I of Trump Towers Atlanta will be 48 stories and include 370 units and 20,000 square feet of retail. Prices will range from the $400,000s to more than $1 million. The guys at Icon, my new hair salon, just two blocks away from the site, are just giddy with excitement. It is their DREAM, their GOAL IN LIFE, to become THE OFFICIAL SALON OF TRUMP TOWERS! Donald has already sent daughter Ivanka to Atlanta to pre-sell the new towers. She landed on the cover of Peach and the AJC, and was featured in every media outlet in town. While New Yorkers kvetch and complain, Atlantans try to figure out an angle or a PR opportunity.